And pink pigs must be flying too because I have finally chosen my word for the year (cue marching band). I suppose you could say I have had a few words swimming around in my head lately in an effort to select my one little word for 2010. I pondered and stewed, hemmed and hawed like I am prone to do. I even played with Wordle to help me see all my beautiful word possibilities. I like words. It's a joy to use them, think about them, learn new ones, and discover forgotten ones from times past. Words are full of such power and potential, they can build up or tear down. 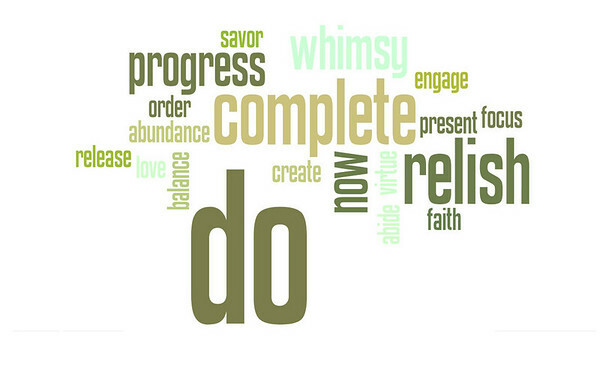 When I first heard about choosing one word as a harbinger of change for each year, I thought it was brilliant. Even though I never followed through and chose one. Until this year. I eventually managed to whittle my choice down to two and then proceeded to let them duke it out in my brain over these last few weeks. In one corner was the word COMPLETE and in the other corner was the word DO. They both represent my desire (and dire need) to follow through with my intentions and ideas, to start them and finish them. I'm embarrassed to admit how many projects or simple actions I leave undone because either I never begin or I fizzle out half-way through. COMPLETE won the first few rounds because it was bold and strong (and truth be told, a tad intimidating), but in the end the itty-bitty word DO proved to be the winner in my brain battle of words twenty-ten. I will put forth effort; I will deal with things; I will take action; I will finish tasks (both ordinary household ones and creative ones). Can you believe one little word can do all of that? *Silly side note: Does anyone remember a funny commercial for butter (I think) from years ago that said something along the lines of "...the flavor lasts until the cows come home!" and then two Holstein cows drove up in a car and honked the horn? I loved that. I know, something's wrong with me. This is a most excellent word (though I love "Complete" as well) and think it's one we could all benefit from embracing. I love having a word for the year, good luck with yours! That cow commercial sounds hilarious, very Far Side Cartoonish, I love those. DO is a powerful word even though it is a puny little one. Reminds me of young David going up against Goliath. I like how you hemmed and hawed over the choices, careful to pick the right one to keep you focused all year. Words are wonderful. I really liked comlpete too, but felt it conveyed too much finishing--like I was already done, and that it SO not the case. But I still like it. I like the simplicity and potential of DO. Excited to see what DO will do this year.